As a professor of Media Studies, I often meet students who express concern about the impact of digital media on their personal lives—for example, their ability to concentrate or to form healthy, authentic relationships. Less often, but occasionally, students voice concern about the torrent of images and less-than-trustworthy “news” they encounter online, and its impact on their ability to engage effectively as citizens. In fact, helping students make connections between the personal and collective dimensions of digital culture is one of the most important, and most difficult, responsibilities I face in the classroom. In my capstone seminar on Media & Ethics, I frame this connection as a matter of personal and collective integrity. On the personal level, to live with integrity requires that we bring our life’s different “goal strivings” into one coherent story (Emmons, 1999, p. 113). Our career aspirations, for example, should jive with our commitment to our family. But integrity is not an individual achievement. Instead, as John Beebe (2000) argues, integrity involves “a willing sensitivity to the needs of the whole” (p. 12). We cannot forge a coherent narrative of our own lives without caring for others and working towards justice in the world. Hope and love are essential virtues as we struggle against the downward pull of cynicism and disgust (Hampden-Turner, 1981, pp. 132-135). [O]ur epoch’s dominating sense that complex problems can be neither understood nor fixed works with the massive globalization of images of suffering to produce moral fatigue, exhaustion of empathy, and political despair. Since the mid-nineties, technological convergence (the integration of devices that were once separate but are now virtually inseparable—e.g. phones, cameras, and computers) has made this struggle even more fraught. Some successful executives claim that smartphones allow us to “blend” work and family life more effectively (see for example Euler, 2016). But research indicates that for many of us, hand-held devices increase the sense of being pulled in many directions at once. Nearly a quarter of cellphone users say the worst thing about their devices is that they are “constantly available and can be reached at any time” (Pew, 2012, p. 2). A smaller, but still significant, number say their phones make it “harder to forget about work at home or on the weekends” (Pew, 2012, p.4). Similar issues of fragmentation play out at collectively. Fear and anxiety are reliable drivers of commercial media. Social media amplifies this problem. Facebook faced backlash for the role that partisan “fake news” played in the recent U.S. Presidential election (Bell, 2016). Twitter also contributes indirectly to political polarization, with conservatives being more likely to use the platform to retreat into ideological echo-chambers (Barberá et al., 2015). Donald Trump exploited this dynamic with considerable, if unfortunate, success (Barbaro, 2015). In these ways we become fragmented personally, socially, and politically. To achieve integrity personally, and to achieve some semblance of integrity as a nation of committed citizens, requires us “simultaneously to stand behind our convictions and to take seriously others’ doubts about them” (Calhoun, 1995, p. 260). To the extent that our media environment undercuts our ability to achieve coherence in our personal lives, and to engage in civil discourse with others, it weighs us down, trapping us in the moral swamp of fanaticism. Contemplative practice lends itself to critical forms of inquiry that can prod us into questioning our complicity with the socio-economic status quo. Barbezat and Bush (2014, p. 29) show how practices aimed at fostering empathy and compassion can cultivate the human capacities for cooperation and connection. These capacities are increasingly important as we face complex global issues like economic inequality and climate change. Such practices help us move beyond “habitual modes of engaging with injustice and suffering,” creating opportunities for renewed engagement (Barbezat and Bush, 2014, p. 183). In his course on Meditation and Media Violence at the University of California, Davis, Alan Klima found that compassion meditation helped his students move beyond the disempowering view of mass media as merely a source of compassion fatigue. Students were able to view familiar scenes of violence in a different, ethically engaged manner that opened up possibilities for “making change in the world” (quoted in Barbezat and Bush, 2014, p. 184). The exercise described below has a similar aim, but uses the natural environment as a grounding force in students’ efforts to cultivate of compassion and moral insight. The exercises described here are aimed at a cultivating more mindful forms of engagement with digital media. The core exercise involves a class visit to a natural setting, described below. Before embarking on that field trip, however, I begin with two preliminary in-class exercises. These are designed to orient students to the concept of mindfulness, the benefits of contemplative practice, and the potential of the natural environment to ground and stabilize our attention. The first preliminary exercise aims to help students develop a more reflective attitude toward their hand-held devices. David Levy (2016) outlines a number of such exercises in his book Mindful Tech: How to Bring Balance to Our Digital Lives. In summary, Levy’s exercises ask students to become aware of how their relationship with their devices, and with specific forms of digital communication (i.e. e-mail or texting), impacts them emotionally and physically. When I conducted one such exercise, students reported a sense of anxiety (in one case, even panic) when confronted with a loss of access to their devices or messaging platforms; and, on the other hand, a sense of comfort and relief when reconnecting. In almost all cases, students reported that they had not realized how deeply their relationship with digital media impacts them emotionally and physically. The second preliminary exercise, which I developed, aims to cultivate among students an awareness of our natural environment as a potential source of ethical and moral grounding. This exercise presumes that students are already familiar with the basic framework of virtue ethics. At this point in the semester, my students had read articles and written essays focused on basic virtue concepts like integrity, wisdom, authenticity, justice, and courage. The goal of the second preliminary exercise is to use nature photography as a way of connecting emotionally and aesthetically with these terms. Figure 1: Images from the preliminary photojournalism exercise. Photograph by author. I began by asking students to read an essay of mine on this topic, “Solitude and Presence: Photo Reflections on Natural and Digital Ecologies,” which is available online (Healey, 2014). In class, I distributed color prints of the photographs featured in that essay (see Figure 1). (Other photos that you, or others, have taken would work just as well!) I asked the class to pass them around, reflect on the photos, and assign specific virtue terms to each photograph. It was surprising to see how much agreement emerged in the virtue terms students assigned to specific images. For example, a number of students assigned the term “persistence” to an image featuring the large stump of a fallen tree. Asking students to think metaphorically about virtue concepts in this way helps them to internalize the concepts in a way that has a more lasting emotional resonance. With these preparatory exercises behind us, we arranged to meet during class time at the College Woods, where I distributed a set of sealed envelopes. Students were asked to enter the woods and find a quiet space and adjust to the natural surroundings before opening their envelopes. 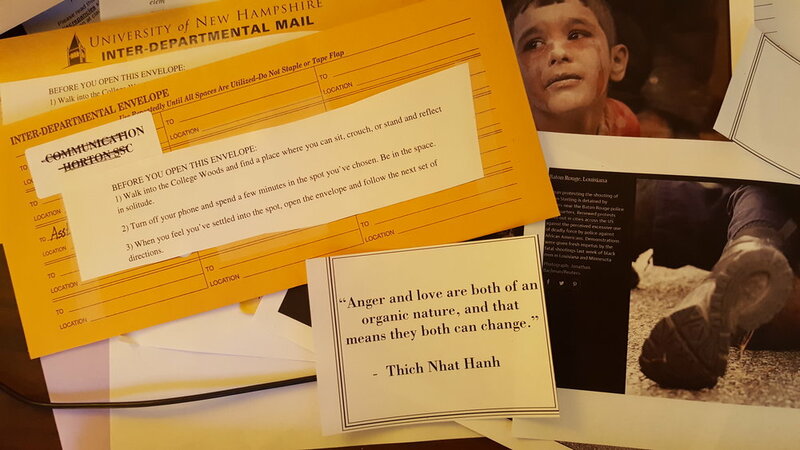 As pictured in Figure 2, the envelopes contained a mostly-random assortment of photographs, quotes, and virtue terms (courage, compassion, etc.). The photographs I used were taken from The Guardian newspaper’s web site, which includes slideshows of the best photojournalism of the previous week. When I conducted this exercise in October of 2016, these photos included images of the Syrian refugee crisis and Black Lives Matter protests, for example. Figure 2: Envelopes containing images and instructions. Photograph by author. Figure 3: Examples of the news photos included in the envelopes. Photograph by author. Students opened these envelopes while sitting quietly in the woods. In addition to the photographs, quotes, and virtue terms, the envelopes contained a map of the woods and a set of additional instructions. I sum, the instructions asked the students to produce a set of original photographs of the natural surroundings. These original photos were meant to represent their response to the concepts, images, and quotes in the envelope they had chosen. Before students posted their images and blog entries, I provided a model blog entry with an original photograph that I took and edited with Photoshop [see Figure 4]. Figure 4: “Anger and Forgiveness”: My photo response to an image of the recent Black Lives Matter protests. My photo response features an image of a fallen tree. It’s clearly been cut by human hands. The branches of the tree struck me as similar to the arms of the men in the photo from Dallas. Though the tree has been cut and has fallen, its branch-arms are still strong. I added a few filters, and worked with the color elements to recreate the red-and-blue visual elements in the photo prompt. The red represents anger. The blue may represent the virtues of love and forgiveness from the quote and concept prompts. The blue leaves on the forest floor offer cooling counter-part to the heat of anger. Following this model, students posted their original photos on their WordPress blogs along with short reflective essays. We curated these photos and blog entries as a class and voted for the best ones. The top five of these photos and essays are featured on our class WordPress page, which is available here. My favorite is a photograph titled “Youth,” taken by Nicole Downing (Figure 4). Nicole took this photograph in response to an image prompt, included in her envelope, of a young boy in the Syria city of Aleppo (see Figure 3). Figure 4: “Youth.” Photograph by Nicole Downing. Used with permission. This photo remains the most powerful amongst the ones I captured. The photo of the boy in Syria reflecting a social issue in the world I thought was going to be the most difficult. However, when I came across this burnt rubble of trees in the depths of the woods, I found it ironic that the stump with a smile on it was present also. From the perspective of nature, this image accurately portrays the depth that a child in Syria may be facing. The smile on the stump portrays a childish, positive, careless light in life, which is typically what may come to mind when one thinks of children and childhood. However, the burnt remains of the trees contrasts a lively, youthful perspective on life with the real struggles and issues that occur socially across the globe. Thus, having this contrast of smile amongst a forest where there are “dead” trees and the destroyed remains of a habitat for many animals, plants and life forms, accurately exemplifies this image of a child in Syria who’s home has been destroyed, and who is struggling to obtain a sense of youth. Kevin Healey is an Assistant Professor of Media Studies at the University of New Hampshire in Durham. Kevin’s research, which focuses on issues of ethics and religion in digital culture, appears in Journal of Media Ethics, Journal of Information Communication and Ethics in Society, Religions, and elsewhere. His commentaries have appeared on Salon, Huffington Post, Religion Dispatches, and The Revealer. In conclusion, the success of this exercise suggests that, even as digital media exacerbates issues of social fragmentation, political cynicism, and moral despair, it can also be harnessed productively in the context of contemplative practice. Contemplative photojournalism, and other such pedagogical techniques, can help students cultivate the virtues of empathy and compassion that are necessary for the long-term health and well-being of the body politic. Barbezat, D. P. and M. Bush. (2014). Contemplative practices in higher education: Powerful methods to transform teaching and learning. San Francisco: Jossey-Bass. Beebe, J. (2000). The place of integrity in spirituality. In Young-Eisendrath, P. and Miller, M. E. (Eds.) The psychology of mature spirituality: Integrity, wisdom, transcendence. Routledge: Philadelphia. pp. 11-20. Calhoun, C. (1995). Standing for something. Journal of Philosophy. 92(5), pp. 235-260. Emmons, R. A. (1999). The psychology of ultimate concerns: Motivation and spirituality in personality. New York: The Guilford Press. Hampden-Turner, C. (1981). Generativity and the life-cycle: Erik Erikson’s concept of identity. In Charles Hampden-Turner (Ed. ), Maps of the mind: Charts and concepts of the mind and its labyrinths. New York: Collier Books. pp. 132-135. Kleinman, A. and Kleinman, J. (1996). The appeal of experience; The dismay of images: Cultural appropriations of suffering in our times. Daedalus, 125(1), pp. 1-23. Levy, D. (2016). Mindful tech: How to bring balance to our digital lives. Yale University Press.